Date/time: Three dates in summer 2018 / 10:00 p.m. – 6:00 p.m.
Meet & greets are always fun, but what about a meet & greet with a brat? That’s even better! 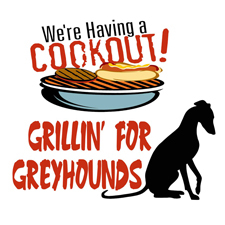 The GPA-WI La Crosse meet & greet that usually takes place at PetSmart will be moved to Grillin’ for Greyhounds at La Crosse-area Festival Foods locations for the summer.